Precon Buyer’s Guide: Core Sets and the Rest! Welcome back to the final installment of the Precon Buyer’s Guide. In previous installments we’ve discussed eBay and theme deck/intro deck retail, splitting the length of Magic into three eras: Vintage, Classic, and Modern. Today we’ll be concluding with a look at the Core Set decks, as well as the majority of the other products ranging from Duel Decks to Duels of the Planeswalkers. Although the prices are set at the time we publish this, it’s our hope that Quiet Speculation can even help improve the financial perspective of the casual player. Had I known when I began my precon collection what I know now, I would certainly have saved a good chunk of change. Hopefully we’ve helped those of you also looking to collect a few more entires in the precon format to do the same. Card Kingdom (CK): Game store in Seattle, Washinton looking to expand its brand. Recently became sponsor of Limited Resources podcast. Amazon (Amazon): Amazon acts essentially as a brokerage, putting the consumer in touch with the inventory of a large number of smaller, independent retailers for precon decks. Rather than identify any specific retailer (since they vary from deck to deck), I’ll be using the best price available for that item, but as you’ll see these often act as something of an outlier and don’t reflect a serious cost. DISCLAIMER: The following data tables reflect a good-faith effort to collect retailer pricing from the retailers’ websites directly. These figures are a snapshot taken no earlier than June 6th, 2011 and may not reflect current pricing and stock with completeness or accuracy. Many sites list their price for an item even if they do not carry it in stock. I will not be reporting these, not least because they can often be inaccurate; the retailer will update a price if there is demand, but often wait until they update their inventory. Now with the boilerplate out of the way, let’s get started! Although not the first entry-level set to feature a number of theme decks (Starter saw print two years prior, and Portal: Second Age even earlier), 7th Edition established the model: five decks, one per color, that would last until Core Set got the reboot with Magic 2010. Also of note was that like the Starter decks, these continued the 40-card model which seemed both simple enough for the beginner to grasp as well as give ample room for adding new cards (expansion-set theme decks would go to this model with 2008’s Shards of Alara). There wasn’t much here in the way of standout decks; they’re very simple affairs. Again, these decks are on the cheaper end of the spectrum, a reflection perhaps of their rather simple nature. There’s no good reason why StarCityGames has Heavy Hitters at a 50% premium over its competitors; the deck’s rares are Rhox and Primeval Force, and are not in high demand. Although as we’ll see they’ll soon fail us, MTG Fanatic continues to hold the award for best early Core Set inventory, and their pricing tends to be within the ballpark. Army of Justice and Dead Again are slightly marked up, but again this is not propped up well by the card selection. Army of Justice has Glorious Anthem and Righteousness, the latter of which would soon be downgraded to Uncommon status. Dead Again features Nightmare and Underworld Dreams. Now isn’t this interesting! Whether it be from early player demand or a smaller print run, Tenth Edition is somewhat hard to find, except on eBay where there always seems to be some lingering about in the $12-range. The interesting innovation here was the adoption of personalities for each deck, personified by the legendary creature drawn from Magic history that each deck was named for (as well as featured within the deck itself). 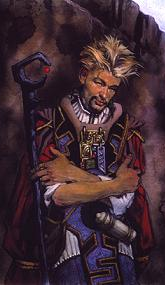 Magic 2010 gave the Core Set concept a radical reboot, and was a tremendous success. The “challenge assumptions” mentality that went into its design and development extended happily to its precon decks as well. In addition to the expected changes resulting from the transition from theme deck to intro pack (a foil rare and a booster now included), each were now two-color affairs, although they still hewed close to the simplistic line of their predecessors. Case in point: they all boast a 12/5 primary/secondary land ratio (save for Nature’s Fury, which is 11/5), meaning that this secondary color is is just a splash. Note also that a Nightmare again has made the cut for a rare, so soon after featuring in 9th Edition’s Dead Again. We Are Legion clearly takes pride of place here as a Boros weenie deck, though its rares (Lightwielder Paladin and Honor of the Pure) are no great shakes. The Amazon prices are clearly divorced from any reality we are familiar with, though it is not without a small dose of irony that we see they have the cheapest. We Are Legion on the board. Next we have the second of the line with Magic 2011. The basic outline of the set differs little from Magic 2010, with an approximate two-thirds/one-third land split between the two types. Both sets boast both a black-green and an blue-red colored construction, and the primary white deck gets paired with its other enemy color, black. To those gazing hungrily at the upcoming decks from Magic 2012, the lesson here is “what’s the rush?” The decks will remain fairly available, and outside of Amazon will be reasonably priced. In June of 2010, pleased with the success of the Duels of the Planeswalkers game, Wizards released a series of decks “inspired by” the decks in the game itself, to serve as a bridge for potential new players to make the jump to the actual paper Magic: The Gathering product itself. These decks were the first ones we ever reviewed over at Ertai’s Lament, and they weren’t especially impressive. It’s worth noting, though, that only Nissa Revane’s deck has not only held, but increased its value. In previous installments we’ve noted the popularity of tribal decks, and Ears of the Elves is no exception. With cards like Immaculate Magistrate, Talara’s Battalion, Imperious Perfect, Coat of Arms], and Elvish Champion- all cards hovering around the $3 to $5 range- it’s not hard to see how ABU might have seen need to jack it up. If you have to have it, hold your nose and go for Amazon, or try fishing on eBay. Ahh, the Duel Decks! One has to wonder if, back in November of 2007, anyone figured that their $20 outlay for the new Elves vs Goblins would be an investment, or if it was just dismissed as another precon product aimed at the casual crowd. If the prices of the first three sets are anything to go on, anyone who felt the latter might well regret it now. Difficult to find, and even more difficult to find at a reasonable cost, it’s hard to endorse any of the Duel Decks at the higher end of the price spectrum, but they can occasionally be had for a steal (like anything else) on eBay. By now the print runs and collectability have stabilised, and they can be had fairly easily upon release and for a time thereafter. Not surprisingly, the alternating Planeswalker-themed ones tend to hold value a little better than their non-Planeswalker counterparts. By the way, when I checked Card Kingdom’s website boasted having an incredible 371 copies of Jace vs Chandra in stock. For those interested, with that kind of backlog they might be willing to make a deal. Also, for those wanting a little more in-depth coverage of the Duel Decks themselves, we’ve got you covered! Another of the newer precon lines, the Premium Deck Series caters to the player who has a foil habit and is willing to pay a high premium for the privilege. For their inaugural release, Wizards played it safe and went for one of the most popular tribes ever to hit the casual table, perhaps forgetting for a moment that “casual nation” as a whole isn’t quite as enamoured of “pimping out their decks” as other market segments (see: Legacy). It made for an odd pairing, and Slivers didn’t sell as well as hoped. Next year, Wizards aimed at a broader spectum of players with Fire & Lightning (as discussed here), and it has to be said that the foiling for that set was stunning. Although it appeared to do better, it wouldn’t surprise me to hear that this line has been discontinued altogether. At the end of the day, who wants to play $35 for a precon deck? If Wizards decided to use this series to reissue Legacy staples, however, they would find a very ready market. Premium Deck Series: Countermagic anyone? Although not directly a “series” the way we’ve seen above, Planechase kicked off the annual tradition of a variant format or multiplayer edition, which would be succeeded by Archenemy and Magic: The Gathering Commander. Although very popular at first, general consensus is that Wizards left their baby stillborn with inadequate follow-up support, and enthusiasm these days is fairly muted. On the upside, so are the prices. Zombie Empire again gets the “tribal premium” with the rest fairly straightforward decks. Metallic Dreams is notable for the return of affinity, while Strike Force is a fairly serviceable Boros deck. While Planechase was all about love’s labor lost, Archenemy actually seems to have cultivated a fair bit of active dislike over its brief life. Intended to put a different spin on multiplayer Magic (particularly the dreaded three-person group), players complained that the schemes it employed were wildly hit or miss, and that it didn’t offer a consistently enjoyable outcome. Others leveled the same charge against Wizards as they did for Planechase: a seeming lack of enthusiastic support (mainly in the releasing of additional plane and scheme cards). Although there were other ways to make the products engaging, Archenemy too seemed to fall to neglect, widely available now for less than sticker price. We’ve given these the once-over before, but in short we’re very happy to see a new precon product, and one that seems to have generated compelling interest. Of course, much of the buzz comes from the Stoneforge Mystic pair in the upcoming War of Attrition Event Deck for New Phyrexia. But having an FNM-ready deck is a laudable objective. To be sure, the decks have their flaws, but the line is already showing signs of improvement. Watch this space. These items tend to be for the collector’s collector these days, because they are insanely priced, hard to find, and, frankly, not all that great. Take the Deckmasters release, for example: you get two decks, one each designed by Jon Finkel and Richard Garfield, using a preset rarity scheme and drawn from Ice Age and Alliances. Were it not for collectability and nostalgia, there wouldn’t be much of a market for something like this these days. Even more egregious is Anthologies, which contains a wonderful mini-book on the history of the game perched right above two steaming 60-card piles. The decks are dreadful, and can be assembled on the cheap at a fraction of the cost, so what you’re getting for your hundred bucks is the book. I own three of these four products, and I can tell you firsthand that your money is probably better spent elsewheres. And on that note, we conclude! I hope you’ve enjoyed the Precon Buyer’s Guide series here on Quiet Speculation, and that it’s helped guide you in some way to save some money in your precon collecting. It’s been great fun to assemble, and of course I would always encourage you to do your own research as well. There are a lot of ways to save money on these, whether it be to assemble it from scratch using singles or happily bid on “gently used” products on eBay. I picked up my Deckmasters box for a mere $20 simply because it was incomplete, missing a 10 x 14 inch poster of a Lhurgoyf fighting a Goblin Mutant which would have languished in the box anyway.